Jimmy Buffett could’ve been thinking of places like this when writing this lyric. As my yellow Water Taxi pulls up to the dock, Hollywood’s new mega-resort casts a 17-story glow steps away. 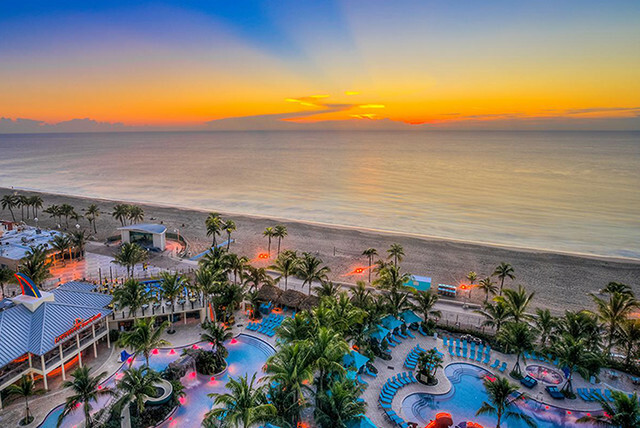 Inside, everyone is abuzz about the opening of the Margaritaville Hollywood Beach Resort, from the resort’s beach cruiser bike designer to world wanderers. “I sell escapism,” the beloved singer-songwriter once said, and once again he’s proved it. At the mid-November grand opening extravaganza, Buffett and his Coral Reefer Band played on a fantasy beachside stage to ecstatic crowds. But aspiring vacationers, take heart: The resort’s escapist festivities are ongoing. Thrill-seekers at the FlowRider Double wave simulator can learn to surf on machine-generated currents reaching 45 miles per hour. Guests can enjoy the resort’s eight restaurants and bars, three pools and 349 waterview rooms. And then there’s the satisfaction of taking selfies in a dream-like lobby decorated with cabanas, chandeliers made from over-sized margarita glasses and a huge blue flip-flop sculpture. Hollywood, in general, has bloomed into a euphoric oasis, from the beachfront to the historic downtown. The Broadwalk, so called because it is composed of artfully arranged bricks instead of boards, is better than ever. People of all ages walk and jog the 2.5-mile oceanside promenade while cyclists and skaters cruise the dedicated bike lane. Dating to 1924, the Hollywood Beach Theatre was recently renovated and renamed the Bandshell. A quick drive west on palm-lined Hollywood Boulevard leads to new free events at ArtsPark at Young Circle. Wonderfully curious sights overflow the Art and Culture Center of Hollywood. And wild outdoor murals depicting rebel beach babes and imaginary creatures keep popping up around Harrison Street. Hollywood is ready for its close-up — and there are getaways to suit any taste. Hitting the wall isn’t usually linked with fun. But I laugh as powerful waves propel me up a waterfall slope and into a padded backboard. The FlowRider is a blast for aspiring surfers and spectators alike. Ronald Scarberry and Rafael patiently teach me how to surf and bodyboard the nonstop breakers. Others quickly achieve a state of flow: Bill Krider from Westminster, Maryland, glides up and down the waterfall on a custom-designed short board. You also can walk the Broadwalk, swim in the warm ocean, do yoga on the sand and work out on the fitness circuit on the picturesque beach that helped Hollywood earn a 2015 TripAdvisor Travelers Choice award. When bicycling, take the Broadwalk, cross quaint little bridges and visit downtown venues and nature parks. Margaritaville guests can borrow cool beach cruisers and rent paddleboards from 5 o’Clock Somewhere Bar & Grill’s dock, which will soon become a Water Taxi stop.